What does a world-wide bakery restaurant, US' largest funeral service provider, and Europe's largest TV producer have in common? They are all ambitious companies who want to set their footprint in the digital marketplace by investing in strategic digital tools to support their digital transformations. They all agree it's time to put an end to digital asset anarchy. 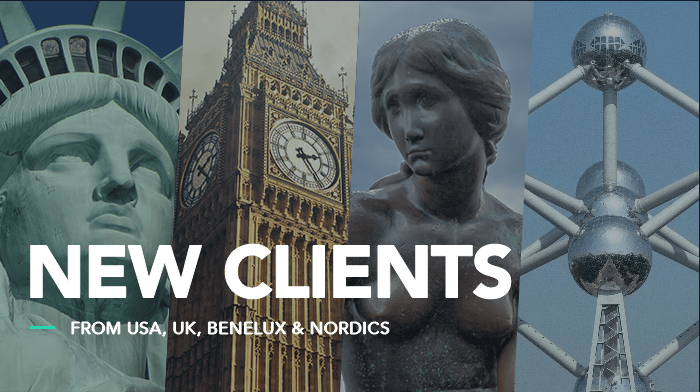 At Digizuite, we are proud to announce a warm welcome to a large group of clients across North America, the UK, and Europe, who have decided to take control of their digital content. Using our Digizuite™ Digital Asset Management software, clients can always find and use the right file on the right channel and are better equipped to serve high-quality customer experiences across channels. Amica: Amica Mature Lifestyles Inc. is known as Canada's premium seniors' retirement residences. Bringing a superior quality of life to seniors, Amica's reputation for comfort and security make it the premier destination for all–inclusive retirement living. Greystar: Founded in 1993, Greystar provides world-class service in the multifamily real estate business. The Greystar team is more than 12,000 team members strong and growing. Uniworld: Award-winning Uniworld—the world's only authentic boutique cruise line™ — offers itineraries in spectacular destinations throughout Europe, Russia, Egypt, and Asia. Analog Devices: Analog Devices, Inc. (NASDAQ: ADI) defines innovation and excellence in signal processing. ADI's analog, mixed-signal, and digital signal processing (DSP) integrated circuits (IC) play a fundamental role in converting, conditioning, and processing real-world phenomena such as light, sound, temperature, motion, and pressure into electrical signals to be used in a wide array of electronic equipment. Service Corporation International (SCI): We’re more than North America’s largest single provider of funeral, cremation and cemetery services. We have 24.000 dedicated employees who provide the finest funeral, cremation, and cemetery services to hundreds of thousands of families each year. Aspen Dental: Aspen Dental Management, Inc. (ADMI) is a dental support organization. Aspen Dental-branded dental practices are committed to treating patients with the compassion and respect they deserve. Dimensional Fund Advisors: Dimensional Fund Advisors L.P. is an investment firm founded in 1981. Dimensional has a long history of applying academic research to practical investing. We offer a full range of equity and fixed income strategies designed to target higher expected returns. JLG: JLG Industries, Inc., an Oshkosh Corporation company, is an American designer, manufacturer and marketer of access equipment (aerial work platforms and telehandlers). The company’s products extend beyond its own well-known brand of AWPs and telehandlers to SkyTrak and Lull telehandlers; TRIPLE-L trailers, LiftPod, and a growing line of JLG vertical and mobile stock picking lifts for material handling applications. Vestel: Vestel is a home and professional appliances manufacturing company consisting of 18 companies specialized in electronics, major appliances and information technology. Vestel, together with its subsidiary brands has a significant share in the European market of consumer electronics and home appliances, in particular, TV sets. As of 2006, Vestel is the largest TV producer in Europe with more than 8 million units sold, accounting for a quarter of the European market. UK Power Networks: UK Power Networks own and maintain the electricity cables in South East England, the East of England and London, making sure your lights stay on. Digitopia: Digitopia specializes in digital signage including narrowcasting, interactive digital screens and mobile solutions. We are a market leader in Belgium, where we are managing over 14.000 screens in 6 countries. Le Pain Quotidien: Le Pain Quotidien (French for the daily bread) is a bakery-restaurant group founded in Brussels in 1990. Le Pain Quotidien serves simple, elegant boulangerie fare made with organic ingredients whenever possible, for breakfast, lunch and dinner. Le Pain Quotidien currently operates more than 220 bakery-restaurant locations worldwide in 18 countries. Ideal Standard: Headquartered in Brussels, Belgium, we are a privately-owned company employing almost 9.500 people, operating 18 manufacturing sites and serving over 60 countries across Europe, the Middle East and Africa. HusCompagniet: HusCompagniet is Denmark's largest and oldest home-builder having built more than 19.000 homes since 1972. HusComagniet is also based in Sweden and Germany. Danske Spil: Danske Spil is a state-owned company operating in the gambling market and was founded in 1948. Columbus: Columbus is a global IT consultancy company offering business IT solutions to the food, retail and manufacturing industries, based on the industry-leading Microsoft Dynamics platform. With 2000 employees across 18 countries, and 27+ years' experience, Columbus has a global leadership in the Microsoft Dynamics domain. VIA: VIA University College is Denmark’s largest University College with 18.000 students, more than 40 bachelor degree programmes, 2.000 employees and 7 campuses. Digital Asset Management software is built to keep your valued digital media files (images, videos, documents, and other files) safe and protected, enabling anyone with access to find, manage and share digital files for future use. Since 2000, we develop the innovative digital asset management software, Digizuite™ DAM, to provide ambitious companies with self-service brand portals, video portals and content hubs for high-quality brand experiences and making digital collaboration easy. Everyone can always find and use the right file on the right channel. We are proud to serve market leaders, helping them become more efficient in digital collaboration, management of digital assets and multi-channel execution to achieve brand compliance and provide better user experiences in all stages of the customer journey. Our clients are some of the most driven companies who value a single source for file management as the foundation for their digital strategies and digital transformations.